Will cut cable up to 1/8. Excellent quality. Cuts clean with ease. Made in the USA. Volkers Cookie Cutter is designed to make the perfect trap bed quickly and easily. You can push the cookie cutter into soft ground or hammer it into harder ground. When hammering in, pound on the ends of the frame, not the rebar handles. Remove by pulling up on rebar handles and you will have an outline of what dirt to remove for your trap bed. Removing just the right amount of dirt assists in firm bedding and reduces the amount of freeze proof dirt you need at your set. 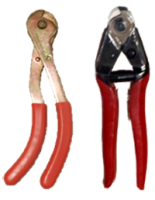 A handy tool for working with wire fence, either woven fabric or single strand. It includes a staple puller, a hammer, and a cutter. 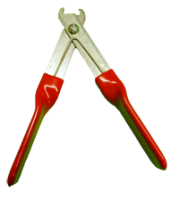 Pliers used to close hog rings on beaver hoops. Made in the USA, high quality. A heavy duty tool that was made to open and close J-hooks. This tool will last you for years. Will work on Mighty Hooks and S-Hooks. Muskrat Speed Stands are an adjustable stand for #1.5 Coilspring traps. Simply place the stand on a fiberglass stake and insert the set trap on stand and adjust to the desired height below the water level. Wire on your bait just above the trap and you are good to go. This new s-hook tool has thicker steel and tempered steel. A great product. We work these hard with great results. 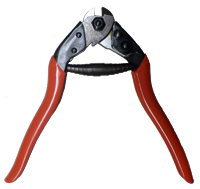 Made by Felco, the world leading manufacturer of professional cable cutters. Gives a clean cut without squashing thanks to the triangular cutting system. The blades and center bolt are positioned in high quality hardened steel for exceptional performance. Has a thumb catch for one-handed operation. With pressed steel handles with non-slip grips. Great for the trap line, cutting trapper wire and etc. Made in China. These trappers pliers are 8 inches in length, are drop forged, have flat jaws, and are side cutting. A good set of pliers is a necessity out on the water, land, and snare lines.